Between the short days, absence of colorful foliage, and the cold, your home’s curb appeal can fall by the wayside. That’s why the Atlantic Maintenance Group is here with some tips on how you can keep your home looking good for the winter. “If you don’t know what to do wash your face and shine your shoes, it never hurts to look smart,” was advice my mother once gave me, and like any good advice can be applied metaphorically to almost anything. 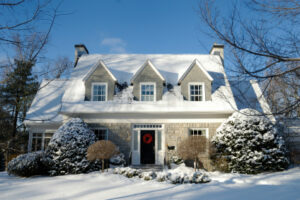 In this case, the most simple, and effective way to keep up your home’s curb appeal during the winter is to keep your yard and house front nice and neat. Rake up and bag, or compost, all of the dead leaves in your yard and flower beds. Clean out your gutters and, while you’re at it, wash your exterior walls and windows. If the paint on your walls is cracking and peeling, paint them. With improvements in paint technology paint can be applied in temperatures as cold as 35°. You’ll be surprised by how much a simple cleaning can do to freshen up your home’s exterior. Now that you’ve cleaned your yard and house, assuming you didn’t keep it immaculate to begin with, show off the work you’ve done with outdoor lighting. Spot lights and accent lights can be used to highlight architectural and landscaping features. Path lighting will not only help guests find their way to your front walk, but help keep you safe by revealing black ice that would go unseen in the dark. String and rope lighting can be used in shrubbery, trees, or on your porch railings to add an element of enchantment regardless of season. And of course the light and the fixtures themselves can be focal elements in your landscaping design. If you’ve cleaned, installed lighting, and still find that your landscaping seems to be missing something it’s time to consider adding some cold tolerant plants to your garden. Evergreens, other woody plants, and cold tolerant grasses can all add a variety of colors and shapes to help liven up your landscape. For evergreens I recommend arborvitae, junipers, and firs. Arborvitaes in particular come in a variety of colors and shapes, from tall blues cones, to low yellow domes. They come with additional advantages of being easy to train, and having soft scale like leaves, rather then pointy and sharp needles, that make them easier to handle. For woody trees that can add to your yard’s winter pallet look to trees with stark bright barks, like the paper birch, or with colorful fruit that stay on over the winter, like the winterberry. Finally, ornamental grasses such as Sweet Flag, Palm Sedge, and Indian Grass, can help liven up your landscape with their unique and visually interesting profiles. Unfortunately, the plants can’t be planted until the ground is warm enough to work, but it’s good to plan ahead and you can plant them come spring so they’ll be ready for next winter. It’s easy to get overwhelmed with your day to day living while trying to maintain your home’s landscaping. The Atlantic Maintenance Group is here to help. We offer a wide variety of maintenance, landscaping, and general contracting services. This entry was posted on Friday, January 23rd, 2015	at 5:23 am	and is filed under Curb Appeal, Exterior Lighting, Lawn Maintenance Service, Painter	. You can follow any responses to this entry through the RSS 2.0	feed. Both comments and pings are currently closed.